Birmingham doomsters Black Sabbath started life as Earth in 1968, before changing their name a year later, inspired by an Italian horror movie of the same name. In 1970, they’d recorded and released their first two albums, Black Sabbath and Paranoid. In the process, not only had they become a commercial force, but effectively invented heavy metal as we know it. Following the global success of the Paranoid album, Bill, together with vocalist Ozzy Osbourne, guitarist Tony Iommi and bassist Geezer Butler, prepared for what was to become one of the most celebrated and crucial records of their career. As on the previous albums, Sabbath again worked with producer Rodger Bain and engineer/future Judas Priest producer Tom Allom. This wasn’t the only change for the recording sessions – which happened at Island Studios in London from February to April 1971. For instance, the band now had a lot more time at their disposal. It was also a record where the band generated a heavier sound than they’d done before. Both Tony and Geezer detuned, in effect coming up with the blueprint for doom and stoner music. Black Sabbath were also still able to keep their excesses and appetites under some sort of control. The insanity of indulgence was still a couple of years away from engulfing them. “This is a workshop in heavy music. Even when we did it on the last reunion tour three years ago, it got the audience going like crazy. I know it’s popular in the UK, but in America it really made a mark. When we first began to play it on tour in the States, it was just when the bodies were starting to come home from the Vietnam War, and the casualties. Another significant moment on the album came with After Forever, which surprised many by talking openly about Christianity. Was this Sabbath distancing themselves from the Satanic and occult imagery of the past? Bill believes this song’s implications to be profound in terms of the band’s outlook on life. “What we were doing on After Forever was asking relevant questions about the validity of Christianity, in particular Catholicism. We were voicing our own inner concerns about it all, asking everyone if they were prepared to accept what was being said, without questioning whether this was right or wrong. For the drummer, this was a major turning point in the way Sabbath were thinking about not only their music, but also about life in general. “We’d seen a lot of the world by this point, thanks to our hectic touring schedule, and we had changed as people. That sort of thing is inevitable. And we were all trying to figure out who we were, and how we fitted into the world. I know that personally I was still coming to terms with everything. I was still only 23, and it would be another few years before I discovered myself, and became more comfortable with who I was. This is reflected in the album’s title, something that wasn’t as straightforward as had been the case with the previous pair – and was subsequently to be true of most other Sabbath record titles from the original line-up. Bill believes this was chosen to reflect that the band were far from being the rock stars many feared they’d become with success. Bill underlines that success – and it had been considerable by this juncture – hadn’t altered their attitude. The album actually opens with one of the most celebrated tracks of the band’s career – Sweet Leaf. And this begins with a cough – the sort of startling ‘effect’ most bands would have cut as being somewhat embarrassing, or even unprofessional. Not Black Sabbath, though. Bill is still fiercely proud of the idea – and stoutly defends the concept. “Yes, this was done deliberately. And totally appropriate for the song, because it is about marijuana. Master Of Reality was released in July 1971, and immediately became a major success. In the US, not only did the record make it to number eight on the charts, selling half-a-million copies in advance (the album has now sold over two million), but in the UK it reached number five. By comparison, the Paranoid album reached number 12 in the States and number four over here. So the band had proven their somewhat surprise success in 1970 was no flashbomb-in-the pan. 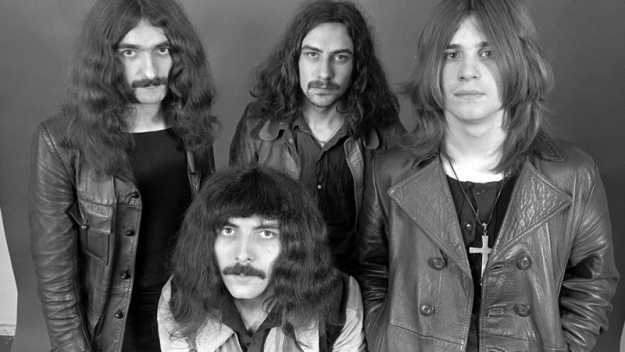 Sabbath also undertook their most ambitious tour to date, going on the road for an astonishing 14 months, including a 22-date sold-out trek around the UK in spring 1972. They were clearly reaching new peaks of achievement. Bill recalls the Master Of Reality period as the end of an era, as well as the birth of the next phase. Today, nearly 30 years on, the album not only stands in its own right as a great record, but one that has inspired succeeding generations of musicians.